1. Boil the sugar and water over a gentle heat. 2. Once the sugar has turned a caramel colour add the sea salt and remove from the stove. 3. Add the cream and butter, and whisk to incorporate. 4. Dip the base of the pan into some iced water, this will stop the caramel from colouring any further. 1. Place the egg yolks and sugar into a metal bowl, whisk the egg yolks and sugar until they are pale in colour. 2. Melt the chocolate and butter. 3. Whisk the melted chocolate and butter into the egg and sugar mixture until thoroughly combined. 1. Cream the butter and sugar together in a bowl until well combined, then beat in the egg yolks, one at a time until full incorporated into the mixture. 2. Mix in the flour until the mixture comes together as a ball of dough. 3. Tip the pastry out onto a floured work surface and knead briefly until smooth. 4. Wrap the pastry in cling film and chill for 30 minutes. Alternatively, it can be frozen for use at a later date. 5. Line 8x9cm pastry tins. 6. Line the pastry with baking parchment then fill with baking beans (or uncooked rice). 7. Transfer to the oven to bake blind for 10-15 minutes, then remove the greaseproof paper and baking beans (or rice) and return to the oven to bake for a further 3-5 minutes, until it is just cooked and golden-brown. Remove from the oven and set aside. 8. Reduce the oven temperature to 170C/345F/Gas 3. 9. 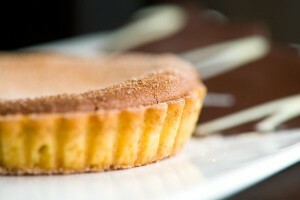 Place equal quantities of caramel between the tarts top with the equal portions of chocolate mix. 10. Place the tarts back in the oven and cook for 6 minutes. 11. Serve whilst still warm with some semi whipped cream to the side. the recipe says that you need double cream and butter for the caramel, but doesn't include any instructions on how to incorporate these ingredients. is this a mistake? or should the ingredients be added to the pan?